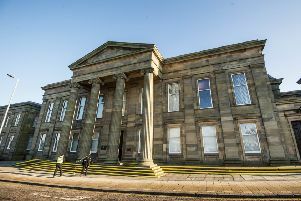 A Bellshill man, who made over £120,000 through an illegal code-sharing scheme, has been ordered to repay the money. The case against Gavin Gray was the first card sharing conviction of its kind in Scotland. The 27-year-old illegally sold decryption codes for premium Sky TV channels, including Sky Sports and Sky Movies. He had been given the codes for his personal use, but sold them to a list of 1800 clients who paid £5 a month over a four year period after advertising on dedicated card sharing websites and forums. When police searched his home they seized £44,500 hidden in a safe in the loft and later seized a further £80,000 from his bank account. In January of last year Gray pleaded guilty to running the fraudulent scheme and two months later was sentenced to a 12-month Restriction of Liberty Order and a Community Payback Order with 300 hours of unpaid work. On Tuesday a confiscation order for £128,670 was granted at Hamilton Sheriff Court. Procurator Fiscal for Specialist Casework, Liam Murphy, said: “Gray operated a large-scale card sharing scheme which defrauded a broadcaster out of more than a million pounds over four years.